"Drink tea" redirects here. For the practice of drinking tea, see Tea culture. Yum cha (simplified Chinese: 饮茶; traditional Chinese: 飲茶), also known as going for dim sum, is a type of Chinese style brunch tea, which involves drinking Chinese tea and eating dim sum. 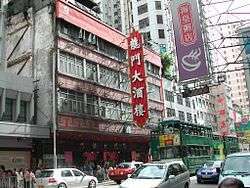 It is popular in Cantonese-speaking regions in China, including the southern provinces of Guangdong and the special administrative regions of Hong Kong and Macau, and has spread to other regions worldwide due to the presence of overseas Chinese. As Cantonese people tend to avoid fried foods early in the day, steamed dishes dominate most dim sum menus. There are also snack-sized portions of pan-fried, deep-fried, and steamed food served in bamboo steamers, which are designed to be eaten communally and washed down with tea. 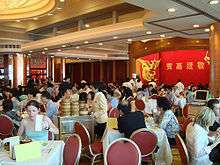 In general, people go to Yum cha with families, co-workers, and groups of people, so it is also a common choice for people to get together and catch up. Yum cha in Cantonese Chinese literally means "drink tea". In the US and UK, the phrase dim sum is often used in place of yum cha; in Cantonese, dim sum (點心) refers to the wide range of small dishes, whereas yum cha, or "drinking tea", refers to the entire meal. 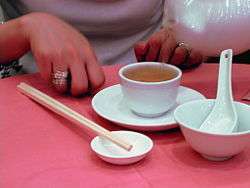 Cantonese-speaking communities in Canada and Australia, however, still tend to use the phrase "yum cha". Dim sum literally means ‘touch your heart,' possibly alluding to the wide range of dim sum that can be found. The Cantonese Chinese term yam cha or yum cha primarily refers to the tradition of morning tea in Cantonese cuisine exemplified by the traditional tea houses of Guangzhou (Canton). Due to the prevalence of Cantonese cuisine outside China, the Cantonese yum cha tradition can be found in many parts of the world. By analogy, yum cha is also used to refer to morning or afternoon teas in other Chinese cultural traditions, even though such meals have different native names. Similarly to a Western morning or afternoon tea, despite the name, yum cha is focused as much on the food items served with the tea as the tea itself. These food items are collectively known as "dim sum", a varied range of small dishes which may constitute or replace breakfast, brunch or afternoon tea. Dishes are usually steamed or fried and may be savoury or sweet. They include steamed buns such as char siu baau, assorted dumplings, siu mai, and rice noodle rolls, which contain a range of ingredients, including beef, chicken, pork, prawns and vegetarian options. Typical desserts include egg tarts, sai mai lo (tapioca pudding) and mango pudding. Many yum cha restaurants also offer plates of steamed green vegetables, roasted meats, congee porridge, and soups. Dim sum can be cooked by steaming and frying, among other methods. The dim sums are usually small and normally served as three or four pieces in one dish. It is customary to share dishes among all diners on the same table. Because of the small portions people can try a wide variety of food. The ways in which dim sum is served has varied over the years. The traditional method, known as 推車 (meaning "push-cart"), dates back to the early 60s, when dim sum items were precooked in advance in the kitchen and brought out into the dining area in baskets by the restaurant employees. These people are generally called 夥計, literally meaning "staff"; however, most customers use the slang terms 靚仔 (meaning "handsome guy") or 靚女/靚姐 (meaning "pretty girl" or "pretty lady") instead of the direct names. Later on, pushable trolleys with a heating function (often using gas) would be used instead of baskets, allowing more items to be brought out at once. Employees would call out the items they were carrying, and a customer who want to order items would then notify the server, who would place the desired items on the table. This manner allows the customers receive hot, fresh items quickly and is efficient during periods of high patronage. Nowadays, many dim sum restaurants have instead adopted a paper-based à la carte ordering system. This method allows only those items which have been ordered to be prepared in the kitchen, reducing the need for leftovers as well as minimizing wasted food or ingredients. A few restaurants use both approaches to serving, making use of push-trolleys during peak hours and switching to on-demand ordering in less busier periods. Traditionally, the cost of the meal was calculated based on the number and size of dishes left on the patron's table at the end. In modern yum cha restaurants, dim sum servers sometimes mark orders by stamping a card on the table. Servers in some restaurants even use different stamps so that sales statistics for each server can be recorded. A place setting of eating utensils for yum cha. Methods of tea-tasting have undergone considerable changes since the Tang Dynasty and the use of covered teabowls is one development of note. The simple yet practical design of covered teabowls makes them an excellent utensil for tea-tasting. The fine painting on these bowls also enhances their aesthetic value. Nowadays a small teacup is used instead in most dim sum restaurants. Chopsticks, a pair of small even-length tapered sticks, are the traditional eating utensils used for yum cha. Chopsticks are commonly made of plastic in the Chinese restaurants. Held between the thumb and fingers of the working hand they are used as tongs to pick up portions of food or to sweep rice and small particles of food into the mouth from the bowl. Dim sum dishes are served in small portions and therefore convenient for eating with chopsticks. Many rules of etiquette govern the proper use of the chopsticks. Toothpicks are frequently used between courses, as it is believed that the aftertaste of one course should not be allowed to ruin one's enjoyment of the next course. Toothpicks are ideal and socially acceptable for picking up those meal items which often defy the best chopstick approach, such as slippery button mushrooms and jellyfish slices served with sesame oil. It is customary to pour tea for others before filling one's own tea cup. It is most gracious to be the first to pour tea. When tea drinkers tap the table with two (occasionally one) fingers of the same hand, an action known as 'finger kowtow', it means thanks. According to a just-so story, this gesture recreates a tale of imperial obeisance and can be traced to the Qianlong Emperor of the Qing dynasty, who used to travel incognito. While visiting the Jiangnan region, he once went into a teahouse with his companions. In order to maintain his anonymity, he took his turn at pouring tea. His stunned companions wanted to kowtow for the great honour but to do so would have revealed the identity of the emperor. Finally, one of them tapped three fingers on the table (one finger representing their bowed head and the other two representing their prostrate arms) and the clever emperor understood what it meant. From then on, this has been the practice. It is rude that the tea cup is full of tea, so while pouring tea, it's better to be about 80% full. In Chinese, there is a slang call "茶满欺客，酒满敬人", literally means, it is fraud for guest if the tea cup is full, but it is a respectation when is alcohol. Traditionally, Yum Cha is only practiced in the daytime (morning and/or afternoon), hence people often use the terms "morning tea" (早茶) or "afternoon tea" (下午茶) when appropriate. The former situation is also known as Yum Chow Cha (饮早茶), which literally means "drinking morning tea". There have recently been increasing trends of restaurants offering dim sum during dinner hours and even late-night, though most venues generally reserve the serving of dim sum for breakfast and lunch periods. The history of Yum Cha can be traced back to the period of Xianfeng Emperor, who first referred to it as Yi li guan (一厘馆, literally means 1 cent house). The one cent house offered a place for people to have a small break with some free-talk, known simply as Tea Talk (茶话). It grew rapidly to become a restaurant-like house or even an entirely new type of restaurant. People called the location at the time "tea house" and the action of going there as yum cha. Since the afternoon tea is imported from Hong Kong, it has led to the invention of "evening tea". Combing with morning tea, afternoon tea, lunch and dinner, it is called "triple tea and two meal" (三茶两饭). ↑ "Dim Sum | Hong Kong Tourism Board". www.discoverhongkong.com. Retrieved 2015-10-06. ↑ 邹, 全荣. ""酒满敬客 茶满欺人" 茶桌上倒茶礼仪你知道吗". 幸禠. 中国网. ↑ 贾, 思航. "说说能增进彼此感情的广式下午茶". Food Report. ↑ "去广州喝早茶 做一回地道的广州人". Lotour.com. 乐途社区. Everything You Want to Know about Chinese Cooking by Pearl Kong Chen, Tien Chi Chen, and Rose Tseng. Woodbury, New York: Barron's, 1983. How to Cook and Eat in Chinese by Buwei Yang Chao. New York: The John Day Company, 1945. Dim Sum: The Delicious Secrets of Home-Cooked Chinese Tea Lunch by Rhoda Yee. San Francisco: Taylor & Ng, 1977. Classic Deem Sum by Henry Chan, Yukiko, and Bob Haydock. New York: Holt, Rinehart, and Winston, 1985. Chinese Dessert, Dim Sum and Snack Cookbook edited by Wonona Chong. New York: Sterling, 1986. Tiny Delights: Companion to the TV series by Elizabeth Chong. Melbourne: Forte Communications, 2002.